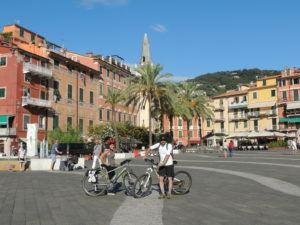 Bike tour La Spezia – Lerici to explore the fascinating Gulf of the Poets by e-bike. We leave La Spezia and cycle panoramic roads with little traffic towards the Gulf of the Poets and its quaint fishing villages Lerici and San Terenzo, who enchanted the 1800s English poets Shelley and Lawrence. Enjoy stunning views over the sea and imposing castles perched on the cliffs, eat local with a typical tasting -lunch and, season permitting, refresh in the clear blue Ligurian Sea. Meeting: 9:30 La Spezia, in front of the bike shop Pako Bike, Via Castelfidardo, 30. Tour ends approx. 16:30.